On graduating from King's College in 1636, James Gordon became a minister at Rothiemay in Aberdeenshire. He is, however, remembered today as a cartographer and historian of considerable repute who assisted his father, Robert Gordon of Straloch, in producing maps for John Blaeu's famous multi-volume Atlas Novus. 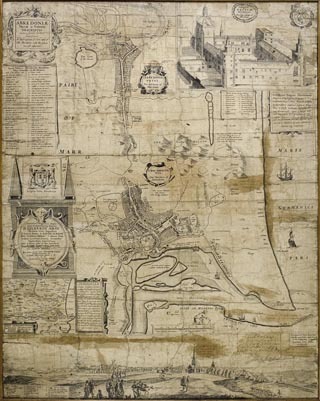 His final major commission in 1661 was to create a map of Aberdeen's two towns, for which the Town Council rewarded him with a silver cup, a silk hat, and "ane silk goun to his bed fellow". Great attention was lavished on his alma mater in the Old Town, compared with the outline sketch of Marischal College. The Union was not just a matter of national politics. Scotland's towns and universities had to adjust to the changes brought about by the new relationship with England. With two well-established burghs (Old and New Aberdeen) and two university colleges, King's (founded 1495) and Marischal (founded 1593), Aberdeen was accustomed to dealing with complex questions of compromise and amalgamation. Many of Aberdeen's political leaders were hostile to the prospect of union. The provost of New Aberdeen in 1706-7, John Allardyce, represented the burgh at the last session of the Scottish Parliament. He failed to vote either for parliamentary union or the Hanoverian succession. Consequently, it is hardly surprising that the British authorities deemed Aberdeen to be a hot bed of disaffection and Jacobitism. The two colleges had already been subject to an unpopular and ultimately unworkable union, the Caroline University, in 1641. Now, in 1707, the political and ideological divisions over the Union of the Parliaments were played out in the two colleges, and in the town.